Tesla CEO Elon Musk announced the final details of the dual-motor, all-wheel drive version of the Model 3 over the weekend, including a top-of-the-line variant that is more expensive than a base-level Model S or X. While we’ve known for a long time that these were coming, this is the most clarity Tesla’s offered yet about specs, pricing, and options. Taken one way, it’s a sign Tesla is working through the early production struggles of the Model 3 and is ready to start offering more diverse options, much like it does with the Model S or X. But Tesla also needs to sell these more expensive Model 3s to grow its revenue at a time when the company is spending more money than ever. In the meantime, Tesla is holding back on making the cheapest version of what is supposed to be the company’s “mass-market” electric car — a decision that Musk says is a matter of life and death for the company. The Model 3 technically starts at $35,000, which is how it has held onto that “affordable” moniker. 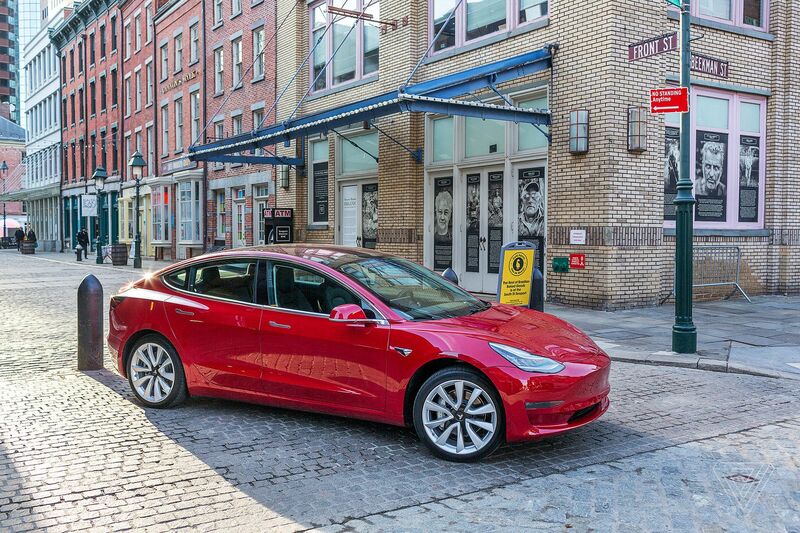 But Tesla decided early on in production that the first version of the Model 3 it would make was the one with the long range battery pack (an extra $9,000) and the premium upgrades package ($5,000), which together bump the starting price to $49,000. All-wheel drive is also a $5,000 option, so that means these new models will start at $54,000 for the foreseeable future — and that’s without Autopilot. The fastest variant, dubbed the “Performance” model, will start at $78,000 and can climb as high as $86,000 if customers add Autopilot and plunk down $3,000 for the “full self-driving” capability Tesla promises will come in the future. Tesla will start delivering the first dual-motor Model 3s in July, according to Musk. Using a motor on each axle means these Model 3s will have increased grip and improved handling. They’ll also be faster. Tesla says they’ll be able to go from 0 to 60 miles per hour in 4.5 seconds, according to Tesla, and they will top out at 140 miles per hour. The Model 3 Performance will be a full second faster off the line, capable of going from 0 to 60 in just 3.5 seconds. But it will top out at 155 mph, the same software-limited top speed as Tesla’s other highest-performing cars. The Performance variant comes with a new carbon fiber spoiler, 20-inch “sport” wheels, and includes Tesla’s premium upgrades package as well as the long-range battery pack, which means it should theoretically last an EPA-rated 310 miles per charge (though driving the car more aggressively will certainly make it tough to reach that max). Tesla has sold dual-motor versions of the Models S and X for years now, and Musk promised that the option would come to the Model 3. In fact, one of the most common questions customers ask him on Twitter is when this version would finally arrive, now that Model 3 production is ramping up. But one of the other most common questions Musk gets asked is: when will Tesla start making (and delivering) the cheapest version of the Model 3 — the one that’s supposed to cost “$35,000 before incentives,” according to the company’s website? That bare-bones version is what was supposed to help Musk make good on his oft-repeatedclaim that the Model 3 is a “mass-market car” that is “affordable.” Unfortunately for customers who are waiting in the reservation queue for that version of the Model 3, it’s still a ways away, and the target is in flux. Musk said over the weekend on Twitter that the base version of the Model 3 won’t ship until “3 to 6 months” after Tesla starts making 5,000 Model 3s per week. Last we knew, the company was still inching its way toward 2,500 made per week, with an eye on reaching the 5,000-per-week rate by the end of June or beginning of July. @walalm Yes, my absolute goal w Tesla has always been mass market electric cars. Will finally get there with Gen3 program. The reason Tesla is waiting to make the most affordable version of the Model 3 is simple: Tesla makes more money on the more expensive models. As we learned at the beginning of the month, when the company reported its earnings for the first quarter of the year, it’s currently losing money on every Model 3 that it ships, despite ultimately targeting a 25 percent margin on the car. That’s a precarious situation for a company in the middle of a well-documented cash crunch. It’s spending more than ever, and even though it brought in more revenue last quarter than any before it, that number was slightly inflated by a change in how the company does its accounting. Meanwhile, a third of the company’s cash reserves — nearly $1 billion out of a total $2.7 billion — comes from refundable deposits on its products. To cut costs, Musk has ordered the company’s finance team “to comb through every expense worldwide, no matter how small, and cut everything that doesn’t have a strong value justification,” according to a recently leaked internal email. He’s flattened Tesla’s management structure as part of a “thorough reorganization,” and he is “trimming activities that are not vital to the success of [Tesla’s] mission,” according to another email. While Musk swears that Tesla can turn the company’s financial situation around without raising more money, analysts disagree. Some think he’ll need to raise a few billion before the year is out, and others aren’t even sure if that will be enough to keep pace with the company’s spending. Goldman Sachs thinks Tesla will need to raise $10 billion by 2020 in order to continue meeting Musk’s ambitious performance goals — goals that his compensation is now directly tied to. Even if Tesla ships the $35,000 version of the Model 3 later this year, there are reasons to believe it will be as rare as Krebs suggests. As we’ve known since its debut, it’s not easy to keep the price at that baseline to begin with. Customers have to say no to options like Autopilot (an extra $5,000) or the longer-range battery pack ($9,000). And they only get one color: black. Choosing any other paint scheme is an instant $1,000 bump. There are probably plenty customers who are happy to wait to buy this version of the Model 3. But people who are waiting for the $35,000 Model 3 are also likely to care the most about the $7,500 federal tax credit for EVs. And Tesla is about to hit a milestone that will diminish — and ultimately erase — those potential savings. The program put in place by the government that enables this credit also includes a limit for car manufacturers. Once an automaker sells 200,000 eligible cars, the rebate remains at the full level for the next two financial quarters before it is cut in half to $3,750. Six months later, it gets halved again before it completely phases out. Tesla is nearly at 200,000 cars sold in the US, and so that clock is about to start ticking. If the company somehow doesn’t hit 200,000 cars sold until July 1st, though, the rebate will remain in full through the end of this year. Tesla is still years away from reaching the kind of total production volume that makes it possible for traditional automakers to sell cars at or under a $35,000 price tag. So the company remains inherently incentivized to focus on the luxury segment of the market, where margins are higher and options / upgrades are an easier sell. People will surely argue over whether this means Musk misled people by promising the Model 3 would be a “mass-market” car that was “affordable.” What’s more clear than ever, though, is that the car is more than just a bellwether for electric vehicles. As Musk says, it’s also the key to Tesla’s survival.